SPAIN: Eleven Spanish companies, including global giants Iberdrola, Acciona and Alstom Wind and Gamesa have united with 22 research centres in the Azimut project to develop a 15MW offshore wind turbine. The project, which runs to 2013, aims to "establish the technological bases and knowhow to be used later for developing a large offshore machine," according to a Gamesa statement. The company’s director of technology development, Mauro Villanueva told Windpower Monthly that although the participating companies and institutions would have to share the technical knowledge, there would also be "a lot of interpretations and experiences exclusive to each individual one". The €25 million project has been approved for partial finance by the Strategic National Technical Consortiums (CENIT). CENIT is a state-run programme aimed at uniting competing national sector players on research to keep Spanish technology among the global leaders. Villanueva said: "That programme precludes the development of a machine design or prototype. "What it does is unite the industry in exploring and consolidating concepts through modelling, simulations, small-scale prototypes and other research activities". Under the agreement, each company has been assigned a specific research area with several common objectives: to research technical solutions bringing offshore costs closer to those onshore. Gamesa, which has made offshore central to its strategic growth plans, will focus on rotor configurations and materials, including new coatings protecting against the corrosive saline environment. The company will also study the relationship between rotor performance and different foundations—including floating platforms—as well as the impact and prevention of lightning strikes and ice accumulation. Gamesa will also study the mitigation of rotor interference with radar. Acciona’s turbine division will research generators and electrical conversion while the company’s development wing will focus on construction techniques and operation and maintenance. Alstom Wind, currently developing offshore structures in other projects, will focus on that area in Azimut. Utility Iberdrola, also pinning its future on offshore wind, will research the grid integration of offshore wind. The other corporate participants in Azimut are electronics and control companies Técnicas Reunidas, Ingeteam, Ingeciber, Imatia, Tecnitest Ingenieros y DIgSILENT Ibérica. Villanueva highlights the high-power private sector participation in Azimut, an aspect he sees as "largely missing" in EU-funded wind research programmes. The uniting of "major commercial companies to tackle real challenges" is vital to the industry, he says. 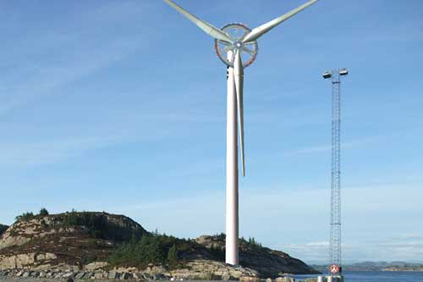 The development of a 15MW offshore turbine would a number of 10MW projects in development. Chief among these is Sway’s floating turbine and Clipper Windpower’s Britannia turbine. However there are doubts about whether even 10MW is economical in terms of cost of energy. Speaking about the trend for greater capacity offshore turbines, Garrad Hassan GL principal engineer Joseph Phillips said it is not necessarily a case of bigger is better. He said: "Both cost and risk need to be taken into account when determining the capacity of a new wind turbine product. "With respect to the former, the most useful metric is some form of Cost of Energy, which takes account of capital and operational costs as well as energy production over a turbine's lifetime."